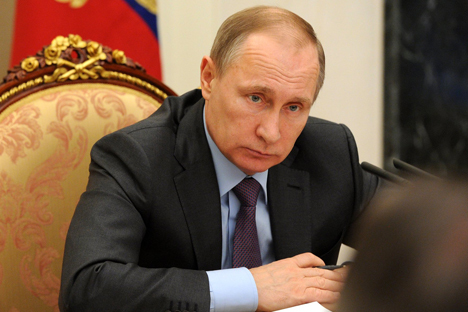 Vladimir Putin will meet with Francois Hollande on Oct. 19. The Russian side continues preparations for the visit of President Vladimir Putin to Paris on Oct. 19 during which the talks with French President Francois Hollande will be held, Kremlin spokesman Dmitry Peskov told reporters. "The preparations for the upcoming Putin’s visit to Paris continue, and the talks in the Elysee Palace are scheduled," Peskov said, adding that Putin will also take part in the opening of an Orthodox center. "We have no other information from our French colleagues, we judge from this," Peskov said. Hollande told the TMC television channel on Oct. 9 that he is still deliberating whether the upcoming meeting with Putin would be useful. Criticizing Russia’s Syria action and its airforce support to the Assad regime, Hollande said: "I will tell him that it’s unacceptable, it’s even damaging for Russia’s image."